Besides red, what other hair color do آپ think would look good on Merida? Who's prettier: Queen Elinor یا Rapunzel's mother? Is Brave your پسندیدہ Pixar movie? What do آپ like the most about Merida? چنیں پرستار: Everything about her! Which part of the movie do آپ think is the funniest? Okay, so I have come across a lot of criticism against Merida that she is childish, rude, reckless, selfish and what not. But since she's my 2nd پسندیدہ princess, i'd like to put up a case in her favor for people to consider and see her in better light. I have tried to dissect the movie scenes, probed into possible perspective on various minor details that may have been overlooked. He's funny and I liked him a lot at the beginning. I don't like the way he was acting when the lords were introducing their sons. I also liked how he supports Merida. 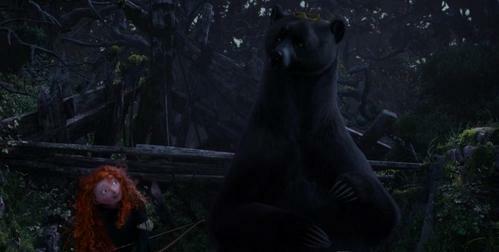 My favourite part is when he was laughing with Merida, while she was making fun of the lords' sons. Overall, he's a great character. They're very funny and mischievous. I like their reactions of taking the food from Maudi. I find them a bit intelligent. Overall, I love their reactions. It's okay. I love the glitters around it. I don't like the colour (I like the white parts though). It doesn't fit Merida much. It has a great meaning and message. The موسیقی is also nice, I don't enjoy the singing voice much. I like it but I feel that it's a mess. I love the lyrics but I don't like the way the men shouts. I love the موسیقی and the scene. The singing voice was also amazing. It is meaningful and I can relate to it. Though yes. I'm aware an مضمون like this has just been written but the مصنف is fine with it, I've been writing this for the past two days. It brought me to my پسندیدہ singer, Julie Fowlis,who sings Touch the Sky and Into the Open air in the movie. a comment was made to the poll: How old do آپ think Merida is? a comment was made to the poll: Which redhead do آپ like more? What is the name of berry that Elinor picks in the forest? What do آپ think about shipping Merida with boys from other fandoms?